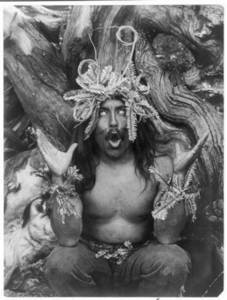 Description: Free black and white picture of a Koskimo Kwakiutle Indian tribe shaman emerging from the woods. He is possessed by supernatural power after having spent several days in the woods as part of an initiation ritual. His initiation into the secret society of the Kwakiutls involves cannibalism and sacrifice. This tribe lived in the Pacific Northwest part of the United states. Circa 1914.